According to a government backed report it is greener and more cost efficient to improve existing housing stock - including those that leak energy like a sieve - than to build new houses. The message for the building industry could not be clearer. Replacing old houses with new housing stock is not an option. Or so it would be if the UK didn’t face an estimated 1.1 million housing shortage by the year 2022. The report by Lord Best,* does not cover housing in Scotland and Wales. According to a recent statement by Mark Carney it is the shortage of housing stock that is largely responsible for the inflationary spiral in house prices. So we need to build more houses. The government is committed to reducing greenhouse carbon emission by 80% by 2050. The housing sector accounts for 27% of all greenhouse gas emissions in the UK. The largest contributor to greenhouse gases in the UK. Perhaps it’s time for the housebuilding industry to take a leaf out of that other carbon emissions giant, the car industry. Unlike houses new cars are built with their end life in mind. In the USA, 95% of the country's vehicles are recycled. Recycling cars is big business - the USA’s 16th largest. Grossing $25 billion a year. On the plus side, the UK uses more recycled and secondary aggregates to build new houses than any other country in the EU - latest estimates put that figure at around 25%. If the UK is to meet the growing demand for more affordable housing together with its EU commitment to lowering carbon emissions we can no longer afford to keep burying the problem that is old housing stock. Bonfires and landfill have no place in a housing market that needs to reduce its carbon footprint and build more houses. Recycling plants on the other hand do. * Government commissioned report on housing carried out by Lord Best former Director of the Joseph Rowntree Foundation. 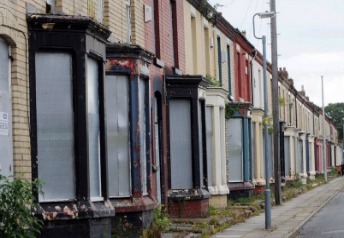 The figures refer to the gap between supply and demand for housing in the UK.